This run more or less put Georgia in the College Football Playoff (we assume). The No. 6 Georgia Bulldogs have almost surely locked up a College Football Playoff bid with a 28-7 win over No. 2 Auburn in Saturday’s SEC Championship Game. 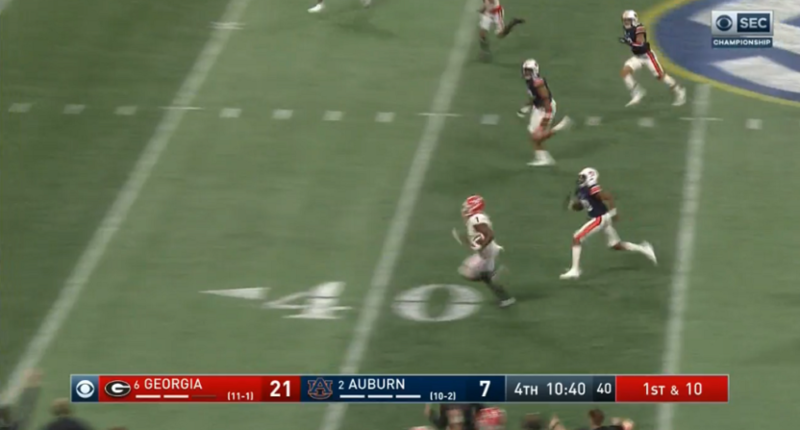 And, while the final score would indicate the game was already locked up anyway at this point, a 64-yard touchdown by D’Andre Swift with 10:34 to go in the fourth quarter really put the game away. The electrifying freshman from Philadelphia only has 73 carries on the season, but has taken those carries for 597 yards (or, a ridiculous 8.1 yards per carry). You can be sure that Swift will have the attention of whoever is Georgia’s next opponent, in the College Football Playoff (we assume).